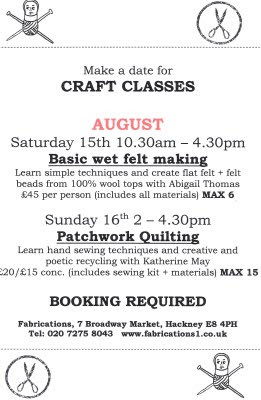 I am teaching a basic beginners day course on Saturday 15th August in Fabrications which is a lovely haberdashery come textile design gallery on Broadway Market in Hackney. The price is £45 for the full day which includes all materials, tea and my homemade cake! If you could pass this on to anyone you think might be interested please do!